Search Results for "skull and cross bones"
Dark silhouetted interior of Sedlec Ossuary altar back lit from stained glass window. Push in passing burning glow from candles to dark altar with crucifix below window. 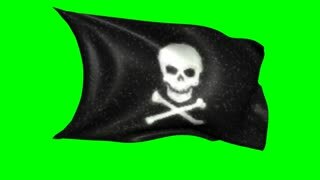 A jolly roger flag blowing in the wind. 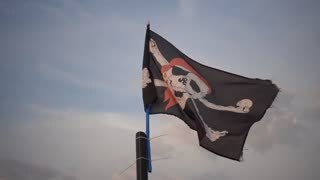 Jolly Roger is traditional English name for flags flown to identify pirate ship about to attack. 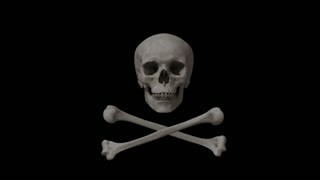 Skull and crossbones symbol on black flag, was used during the 1710s by pirate captains. Pirate flag on the mast. Skull and Bones. Floating pirate flag animation.Red on white.HD 1080.Seamless loop.Alpha matte.